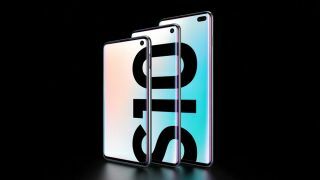 Samsung has finally unveiled its premium Galaxy S10 series, with the Galaxy S10, Galaxy S10 Plus and Galaxy S10e each offering cutting edge functionality and specs at different sizes and storage capacities. In order to secure your chosen Galaxy S10 model on day one, we recommend pre-ordering the device and buying it outright. To help you do this, we're rounding up the best pre-order offers and outright prices currently available from Australia's biggest retailers as soon as we find them – check them out below! This year, Amazon Australia has stepped into the ring with some fantastic offers on the Samsung Galaxy S10 range. Anyone who pre-orders the Galaxy S10, S10 Plus or S10e before midday on March 6 will receive free wireless Galaxy Buds (valued at $249) as an added bonus, along with the same priority shipping that's usually reserved for Prime members. Thanks to the aforementioned priority shipping bonus, Amazon will deliver the new Galaxy S10 devices to its customers right on the phone's March 8 release day, with 90% of the country’s population covered under that promise. Check out the best Samsung Galaxy S10, S10 Plus and S10e prices on Amazon Australia below. Now that the flagship handsets have been officially announced, you can pre-order them for outright purchase from Samsung Australia's website. As expected, Samsung is offering free wireless Galaxy Buds (valued at $249) with every pre-order of a Galaxy S10 handset that's made before March 7. You pre-order your chosen Galaxy S10 model directly from Samsung at the links below. Of course, the Samsung Galaxy S10 will also be available to buy elsewhere – so those who are planning to buy the phone outright would do well to keep an eye on the likes of Amazon Australia and other leading retailers, as they're likely to have some great deals on offer leading up to the Galaxy S10's March 8 release date. Here's more information on what you should expect to pay for the S10, S10 Plus and S10e in Australia. Of course, if you aren't looking to drop thousands of dollars on a new smartphone in one go, you could opt to pick the Galaxy S10 up on a contract through one of Australia's major carriers – Telstra, Optus and Vodafone are offering a variety of plans for each Galaxy S10 model. Here's more information on various telco plans currently on offer for the S10, S10 Plus and S10e in Australia.